I posted this black bean and sweet potato chili on Instagram the other day and got a couple requests for the recipe, which you can find here! We sprinkled cotija on top, which I thought balanced the sweetness in the soup. We've also tried this recipe and love it just as much! 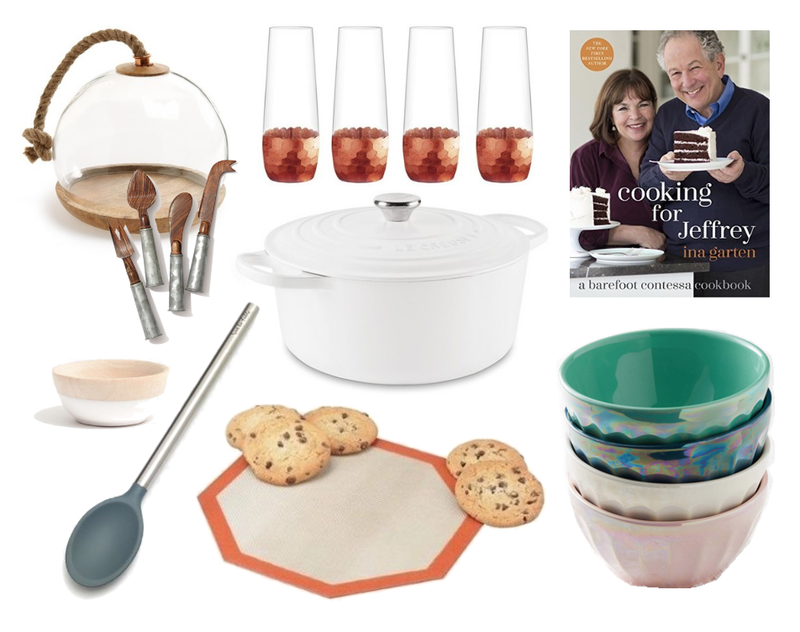 Also, for all the cooks, bakers and chefs in your life, I've put together some fun gift guide ideas that will become staples in the kitchen! Serving Tray + Cheese Knives: The perfect way to showcase your cheese or special dessert! Stemless Champagne Flutes: With a copper touch! Cooking with Jeffrey Cookbook: Barefoot Contessa's cookbooks are my absolute favorite and this one is no exception! Le Creuset Dutch Oven: We finally bit the bullet and bought one of these bad boys and it is definitely a game changer when it comes to cooking. PLUS, it's dishwasher safe! Worth every penny, IMO and you can also get the one with the gold knob, which is especially pretty! Wood Pinch Bowls: Perfect for salt or for finger foods like nuts or olives. Silicone Spoons: We also have these and swear by them! Silpat Microwaveable Mat: We love our Silpat and use it regularly. I'm super intrigued by this microwaveable option! Lustre Pasta Bowls: Pretty bowls make everything taste better, right? Love the lustre in these and how versatile they are!